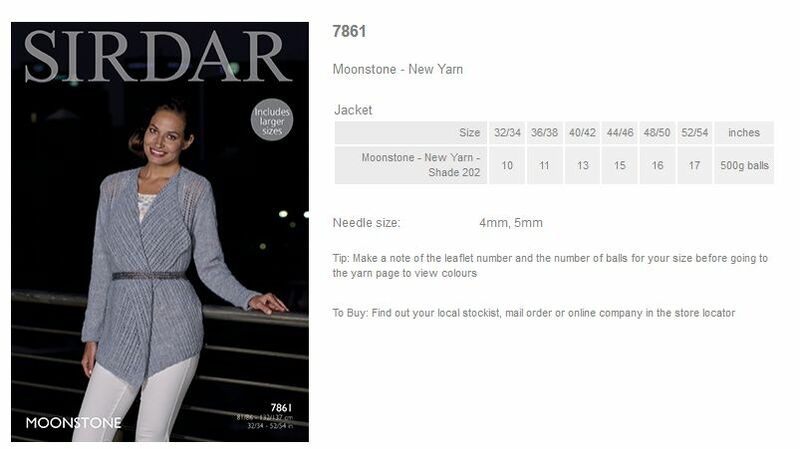 Yarn Type Who doesn’t love a bit of glitz and who therefore won’t love Moonstone?. Moonstone is a yarn that comes in 3 gorgeous jewel tones, as well as white, grey and black, each of the shades is dusted in clear glass beads to create an effect that is absolutely stunning. Moonstone is a fantastic yarn for creating the most beautiful of accessories and we have therefore included a free pattern for a one ball beanie hat on the ball band! 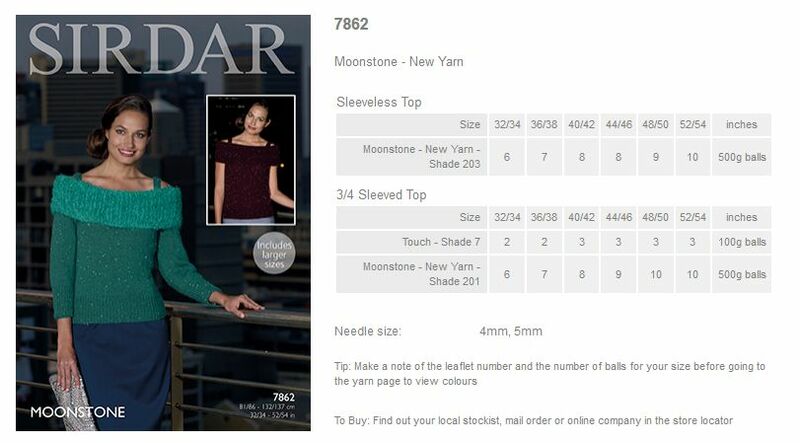 Sirdar Moonstone also makes the most beautiful of garments, we have 4 gorgeous leaflets with designs for women, there are shawls, patterned cardigans and Bardot style sweaters, one of which is trimmed with our incredible Touch yarn. Go on dazzle in Sirdar Moonstone. Machine washable. Wool Cycle. 70% Acrylic, 30% Glass Bead. 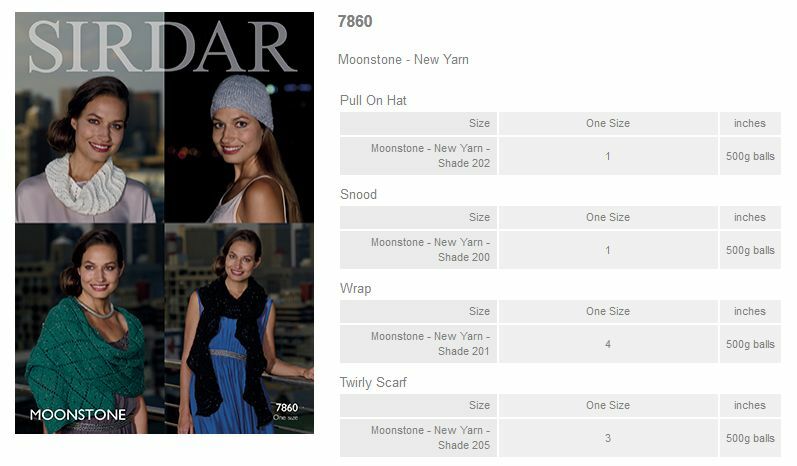 7860 - Pull on Hat, Snood, Wrap and Twirly Scarf using Moonstone. Leaflet with designs for a Pull on Hat, Snood, Wrap and Twirly Scarf using Moonstone. Leaflet with designs for a Jacket using Moonstone. Leaflet with designs for a Sleeveless Top and 3/4 Sleeved Top using Moonstone. 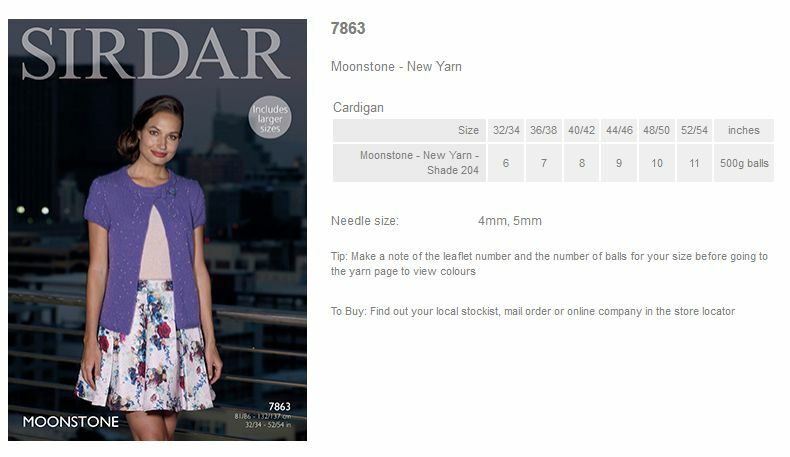 Leaflet with designs for a Cardigan using Moonstone.